Is it truly better to give, than receive? Debatable. Anyone who has ever said that is probably used to finding tube socks in their holiday present pile. But Starbucks is bringing that worn-out adage to fruition this holiday season, by launching its 10 Days of Cheer giveaway campaign. 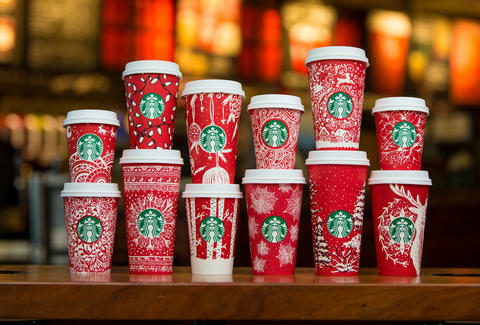 From December 23rd to January 2nd, 100 Starbucks stores each day will serve up tall espresso drinks, like the seasonal Eggnog Latte or the Caramel Macchiato, completely free of charge. Just to be clear, they will be the ones giving, and you will be the one receiving in this scenario. Here's how it works: Every day, 100 new stores will be selected to participate in the promotion (you can find a state-by-state list that updates in real time, right here). Each store that's selected will be offering the deal from 1-2pm, before the "Pop-Up Cheer Party" (their words, not mine) moves on to another 100 locations the next day. So yes, you need some luck on your side for the promotion to hit your local shop. It's a little like roulette, except there's really no way to lose all your money and ruin your life. In addition to the free espresso drinks, locations that have been selected for the daily "Pop-Up Cheer Parties" (again, their words, not mine) will be giving away gift cards featuring discounts on items across the menu -- from drinks like the Holiday Spice Flat White, to lunch items like Bistro Boxes. The participating locations aren't revealed till the day of, so there's nothing you can do except wait, watch, and hope -- like a little kid sleeping on the couch trying to catch a glimpse of Santa Claus on Christmas Eve. Except Santa never spelled your name wrong. Well, unless your parents kind of sucked.